Currently we offer a delivery service to mainland UK. This excludes Nothern Ireland and certain Scottish postcodes, please see below. Our standard delivery service takes 1-3 working days from despatch of goods and is usually carried out by Royal Mail or a reputable national carrier such as TNT. As most of our Willow products are cut and prepared to order, we aim to despatch within 7 days of your order. If your order is time sensitive and required as soon as possible, please contact us directly on 0845 020 42252 to discuss your requirements in more detail. The cost of delivery depends on the physical dimensions of your order and our charges range from £4.99 to £25.00. 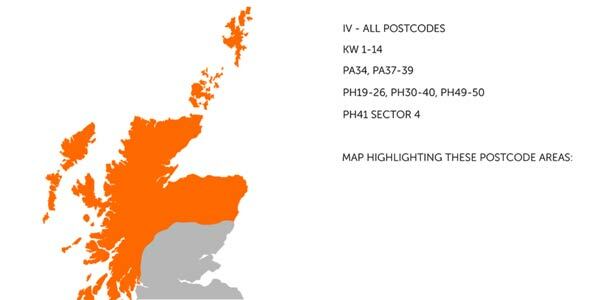 If your location is within the following Scottish postcodes please contact us directly to discuss your order. Water Willows takes great pride in producing high quality willow products to all its customers, however if you are not satisfied with the product, please contact us within 24 hours of receipt so that we can arrange a refund or replacement. Due to the nature of our products we can only guarantee delivery of the product to you in good condition ready for planting. Once you receive it please make sure that you follow the planting and care instructions supplied to ensure success as no warranty can be given as to the growth and suitability.